Protected by darkness last Thursday night, a hooded figure crept up to the Community Center of Masjid Al-Hoda. 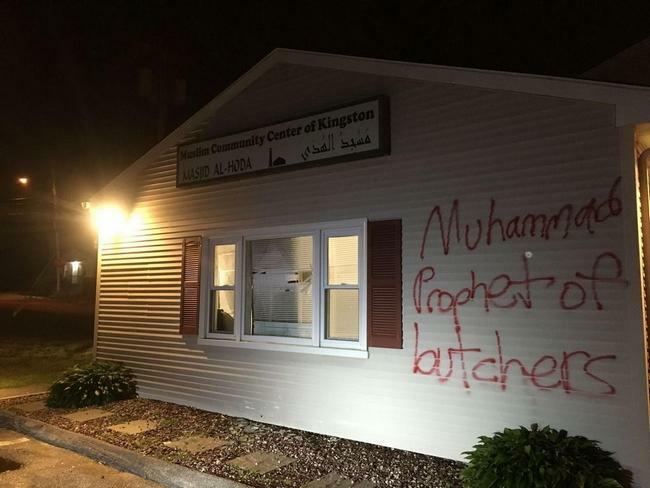 He smashed a window with an ax, painted anti-Muslim graffiti on the front of the Mosque and then, like the coward he is, ran away. This afternoon, people of all faiths along with non-believers gathered with community members to let them know this attack was not just on the Muslim Community, it was on all of us. We were united as human beings who were appalled at the hate and racism behind this reprehensible action. We crowded into the center for an interfaith service and a discussion of what we could do to let it be known this action was not representative of what our community stands for. This is the place I wrote about in “It Takes A Village” . Once called Little Rest, this is my little town. The Mosque is adjacent to the campus of the University of Rhode Island, where I attended college fifty years ago. I took this attack very personally, just as everyone else in that room did. Last Fall, our church had gathered at this Mosque to share a meal, participate in a prayer service and gain a better understanding of our Muslim neighbors. I wrote about it in “To Infinity and Beyond”. It was an enlightening evening. They visited our church for a shared meal the following winter. I knew these people whose sanctuary had been vandalized. I was at a loss for what to say as they graciously welcomed me back. I listened to all the speakers but was especially touched by the young man, who was the first to discover the vandalism on Thursday night. He spoke to us about the fear he felt when he saw the hate graffiti splattered in blood-red paint across the front of his place of worship. He shared with us that since that night, he could not get the picture of the graffiti from his mind – until this afternoon. Now, the faces of all of us gathered here to support his Muslim Community had replaced that picture. And he was no longer afraid to walk outside in the sunshine. Another man said, he wanted to bring the vandal into his home to share a meal and get to know his family. He felt it was the only way to fight the ignorance which was at the base of this racist act and all of the other hate acts that seem to be filling our world today. We agreed education would lead to a better understanding of other nationalities and a greater respect for other’s religions. Gathering our shoes from where we’d left them upon entering the Mosque, conversations continued as people slowly left the service. Many of us glanced over to the now white-washed board covering the broken window knowing it could happen at any of the places we consider to be our sanctuaries. And we realized we lived in perilous times and this is not a time to be silent. Fear and ignorance visited Little Rest Thursday night. It has been a horrific week around our world once again. Eighty-four dead, two hundred innocent human beings injured in Nice. And next week the Republican National Convention convenes in Cleveland. Calling themselves “the law and order party”, republican leaders are trying to divide us by sowing the seeds of fear and ignorance with their rhetoric. We need to counter this rhetoric with our own – our belief that with diversity comes enrichment. This is truly not the time for any of us to be silent. As-salamu alaykum – Peace be upon you. Every week I think I will take time from posting on my blog and work on my book. And every week something happens to cause me to write how I’m feeling. Just before we left the service today, we were asked to tell people about our gathering and our sense of unity in the face of hatred. We all pledged not to be silent in the face of hate crimes against others. And so I came home to write yet another post about our life and times here in the US – a perilous time for us all. Thank you for your visit and your comments. I shared this on my Facebook page and I will reblog your message, Clare! sadly true-Good for you-and Godspeed! God Bless You Clare for writing this . We must not keep silent . These are indeed perilous times and we must work hard at spreading peace and understanding of the other , we can’t let fear of the unknown and/or ignorance be used against our neighbours and just watch and do nothing . Coming together in solidarity – It is the right thing to do. Thanks so much, Clare! The world seems to be driven by hatred, more so than I can ever remember in my 62 years here. Actions like the one you describe here are, sadly, all too common and, to my mind, derive from a basic level of ignorance on which racism and hatred can feed. When our political leaders also feed this, it is difficult to remain hopeful for our future. I know what you mean, it was uplifting to read your post and to see the kind hearts coming together. People like this are needed so much in our world. And people like you, Clive. Take good care. Thank you, Clare, for this moving and uplifting post. You are so right – we must not keep silent. Your community is very special. I felt more positive after reading your post about the basic goodness of us creatures who seem intent on destroying ourselves. Reblogged because love must replace fear. So sorry to hear of this appalling incident within your community, Clare. Bigotry, xenophobia, racism, and all hues of intolerance run through all strata of society, and quite disgracefully we see it tacitly, even overtly, endorsed in the Republican candidacy. The Far Right and Fascism are also on the rise in Europe, once again. Let us hope that sanity prevails, that enlightened leadership wins out, and that empathy and tolerance are rediscovered, as exemplified in your religious and secular group’s wonderful actions. The way you all responded to the hate-attack is remarkable! Only through such combined effects and understanding can we fight this and we all need to strengthen our forces as attacks as these and much more large scale ones are becoming more and more frequent. People should understand that this is never the answer to anything. You make me feel like a kid! 😀 And yes, all is good here… the vacations are about to end soon and I’ve been quite busy this time. I’m planning for a post to tell all about it! Do read it! I was just checking out your spiffy new blog look. I like it! Ignorance is the sorriest weapon of all and it is ignorance that inspires such mindless and cruel attacks upon the peaceful. The attack in Nice must not be bracketed in the same basket … these were the actions of a sick mind but not prompted by any religious nor political motive. I put it in the same place as the German Wings pilot who flew his plane full of passengers into an Alp last year. Sadly, tragically there will always be people suffering from such acute mental issues that we are powerless to understand what can possibly be going on in their minds. In terms of the elections – the fact that the attacker in France was Tunisian must not be allowed to play to the fear of Americans who will then flock to a war-mongering Republican rhetoric. And upon you, My Friend. I can see why you are proud to live in such a town full of natural beauty and the beauty of the human spirit. May the perpetrator become enlightened for himself and the world. May he find peace and love within himself and the world. May his pain be replaced by kindness. This is a wonderful post and I wish more people would use their common sense about what really is a threat. Alaykum Salam. “at the local level, one community at a time” — yes! And I agree, it begins with education — increasing our knowledge & understanding. I commend you & your community for addressing this head on. We are a town built around a university, so that has made quite a difference. Many of the members of the Mosque are students and teachers who believe deeply in education. And they have been active in creating global studies programs at the university and the high school. Now they are encouraging our state leaders to extend these studies into other schools. Also, my Church is directly across from the university and our pastor has enabled our congregation to form a bond with other religious and LGBD groups. All of this has provided a firm basis for creating an atmosphere of compassion for others. I think that is why we were so shocked at what happened last week. Again, thank you for sharing this with your friends, Nancy. Sadly I think that speaks to the magnitude of the problems revolving around prejudice, intolerance and racism here in the U.S., that incidents like this can happen even in a community that prides itself on its awareness and diversity. However, we must keep hope alive by remaining proactive and connected. This has been a good chat. Have a lovely day, Clare! 1 guy, 20ish, possibly a student who lives nearby and resents the Mosque being in the neighborhood.He was seen running off with an ax in his hand. I think it may even be a student. Whoever it was spelled Muhammad and prophet correctly – very telling.I wouldn’t be surprised if he attended the service on Saturday. Your a natural detective Clare. Any guilty looking or illusive neighbours walking around? RE storyboarding > anytime though my way is my way and I havent looked at anyone elses way of doing it. I discovered that years of planning (my no1 skill) suddenly came into fruition > like everything that I am was meant to be within me for that reason. I did everything in A4 lined books and pencil to start off with then went out and bought two huge blank sketchbooks and drew in timelines for each book. I think everything about the project should be done with love passion and beauty. 🕵🏻 🔍 🕵🏻 🔎 There were no female spy emojis! ….and Peace be Upon You, too! Like many, many other American Muslims, the first reaction to an event such as the one in Nice is an automatic prayer – “Oh God, please do not let this perpetrator be Muslim”. These days, God is not answering that prayer a whole lot. Thank you, my friend, for taking the time to bond with people of a different faith. A warm, comforting feeling welled up in me while reading your post. I can’t imagine how frightening it must be for Muslims in our country right now. We all have a responsibility to let them know they are not alone in this and that saner voices will prevail so that they can walk outside in the sunshine without fear. I grew up Catholic and we were discouraged from learning about other faiths, but the pastor of the Congregational Church Charley and I now attend is a wonderful man and is leading us all to do the right thing for human beings of all faiths and life styles.It is very enlightening for me. And you are very welcome, my friend. The greatest strength is when people come together from all religions to fight intolerance. I’m sorry this happened in your community but there is that strength there to hopefully overcome it. I had a group today with my patients on this topic today. We have to see that we are all human beings, created in God’s image. If we hurt another, really, we are hurting ourselves. Many of us are talking about this topic and that, in itself, is encouraging. My best to you and the people in your group. Hopefully, the conversations will continue. It’s funny, another patient said almost the same thing too: we need to talk to each other. As-salamu alaykum – Peace be upon you. A beautiful post. I’m so heartened 🙂 Well done! Gosh, what a moving, evocative piece, Clare! And, what a horrific happening right in your town. Yuck. I’m so sorry, and sad to see these sorts of hate crimes. However, the way your community is pulling together is inspirational. You’re right, it is time we all speak out about what’s right. My hats off to all of you in the community for doing the right thing. You have nice weekend too. what a great piece of writing. It says an awful lot for your community. Great thing to do and I am sure everyone felt better for doing it. I also like the way you went to each others places of worship to learn more about each other and to share a meal. Little things but so important. Now, that sounds more like it. Have a great time. Maybe Mr. Wu will quit his day job and be back to welcome you when you return? Bumped into Mr ( and Mrs) Wu at the local Farmers Market. He said he is too old to work now, but I can see that he was flattered to be asked. Its been a manic summer but somewhat quiet without ” Wuisms” or should that be ” Wu-isms”? Bad things happen when good people do nothing. Clare, I am so inspired by the actions of your community and your post. I firmly believe something good comes out of everything. It is clear you have every reason to be proud Clare. Your community sets a fine example for others. And wishing you a lovely day too. Looking forward to it Clare. What a lovely piece, Clare, and the photos of everyone together, standing up for their community, are really moving 🙂 Thank you for sharing. I checked my blog and it’s still there. When I first wrote it, it was published before corrections, so I put it into private and made the changes and reposted. Maybe something happened to that repost. But it’s still up on my sight. Thanks for the heads up, and I’ll see if others have had problems. Bonne Vacance, Mon Amie! What a wonderful post, Clare, so very supportive of the Muslims in of your community. We have many towns and cities in the UK where communities of different faiths live together. Most of the time there is peace between them all, but at other times, hatred and violence flares. Like you, I long for the time when we can all live together in acceptance and understanding of each other’s beliefs. Your supportive community is to be praised and admired. Hi Clare. Yes, I’d always advise having an editor to look over your work. We all tend to miss things in our own writing that others pick out immediately! Our own eyes gloss over mistakes and we see what we think we’ve written instead. The trouble with me is I put more typos in after the book’s been edited! I’ve had a few to correct that weren’t there when I initially sent the ms to the editor! I also have a habit of missing off closing speech marks. Hopeless case, that’s me. Fortunately my mistakes are rarely grammatical or spellings – other than typos. It must be wonderful for you to be living in a place with so many happy memories. It looks a very homely town. It is that and I hope the homeliness comes across in the book even though it’s a murder mystery. Perhaps more of a St. Mary Mead than a Midsommer?